Admire Vercors’ cliffs, backdrop of this part of Drome and enjoy all the outdoors activities available at the campsites in Die's area and the Drome Valley. Above the wild river Drome, the imposant keep of the Crest Tower stands at the entrance of the Drome Valley. From this beautiful historical city, the river winds through the rocky relief until Die's country. Along its route, our campsites on the riverside in the Drome Valley offer plenty of activities like canoeing or hiking toward exceptional sites such as the Valley of Combeau or the Cirque of Archiane. 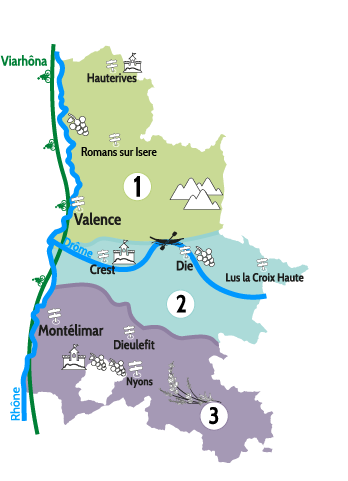 Discover the Clairette de Die AOC also - the region's sparkling white wine. Our holiday village comprises 12 comfortable, fully equipped cottages facing South and with a fantastic view over Fays mountain. We also have a small traditional campsite with 25 camping pitches located at the gates of Beaurières. 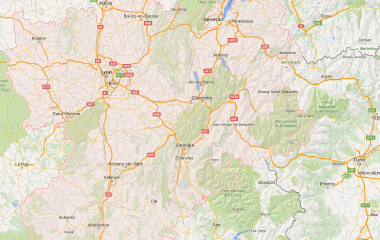 Village Vacance Chanteduc is at an altitude of 800m, on a 1-ha estate planted with trees. It is open all year. In a remarkable site with a panoramic sight on Devoluy, you'll find space, shade and comfort, 100 pitches on 3,6 ha, at only 200m from the village of Lus la Croix Haute and its shops. Discover nature, sports, leisures, festive atmosphere or gastronomy, just stop for a few hours or several days in the village of Grane.